1 000 000 views on YouTube ! About a month or two ago my YouTube channel reached 1 000 000 views ! When I uploaded my first few videos in 2010 I remember being excited reaching 100 views. I guess if I enabled monetisation I might have made a bit of money, but that was never the goal, I just wanted to share what I was working on. Around 80% of those views are from The BloodCrafter video, a Minecraft joke made in 2011 that often went viral over the years. I made that thing in one afternoon, while other projects like Serious Sam 2D and Quake 2D, which took months to finish, have far less views, but still a respectable number. To celebrate these 1 000 000 views I have prepared... nothing. Even this blog post took me few months to finally write. Everything is in a vegetative state. The Broken Mug Engine and the Quake 2D remake in that engine are not legally dead, but progress is extremely slow and it will never be as polished as I would like it to be. I fix a thing or two every few months when I'm bored of doing other things. The original campaign can be finished, but there are bugs all over the place, mostly because all new features I would make, I would leave unfinished and the project grew to a size that is very hard for me to manage. Also it doesn't help that the forums where I have been posting updates about these projects over the years have been shutting down left and right, I will have no one to share this with, but strangers. Another year, another patched old game(s). This time it is Chrome and the expansion/prequel Chrome SpecForce. All I wanted to do is play in 1080p with a FOV that would not give me headaches. Then I discovered Java source code that came with the games. Fix here, fix there, and is basically a whole patch that should be usable to others too. The goal of this "patch" is to enable the games to be played in widescreen resolutions, ultra widescreen, multi monitor setups and in 4K and above by fixing text rendering and FOV issues and properly scaling some HUD elements. Another goal was to increase the visual fidelity of the game by forcing the game to render highest quality assets even when they are far away from the player. Only assets that will actually be changed are the HUD map textures. No gameplay changes have been made. Jackfuste from WSGF helped fix all the FOV issues and I used HUD map textures for Chrome from Chrome Widescreen Mod(Chrome HD Fix). I have uploaded it to ModDB and there are more details and a list of changes there and in the included change log file. I wont post it all again here. Detailed instructions are also included. I recently played a game called BEEP which had a grappling hook mechanic. The game used Box2D, so I wanted to figure out how they did it. After figuring out a combination of revolute and prismatic joints is the best solution, I also wanted to make a ninja rope like in Worms games, where you can move up/down the rope, stand on the rope like it is a pole and the rope wraps around the terrain. I didn't manage to make it perfect, but it kind of works. a) Since it is a rope nothing is stopping the player to move closer to the point where rope connects to the terrain. The rope just stops the player from moving further away than what is defined with joint's maximum length (SetMaxLength()) variable. This makes it impossible to stand on the rope. b) The player can't move up or down along the rope. The joint's maximum length can be changed after it is created, but that will either; try to move the player "by force" upwards if it is changed to lower value even if something is blocking the way(might even just teleport it instantly), or the player will just fall down a bit if the rope is changed to be longer. Alternatively a distance joint can be used instead of a rope joint. 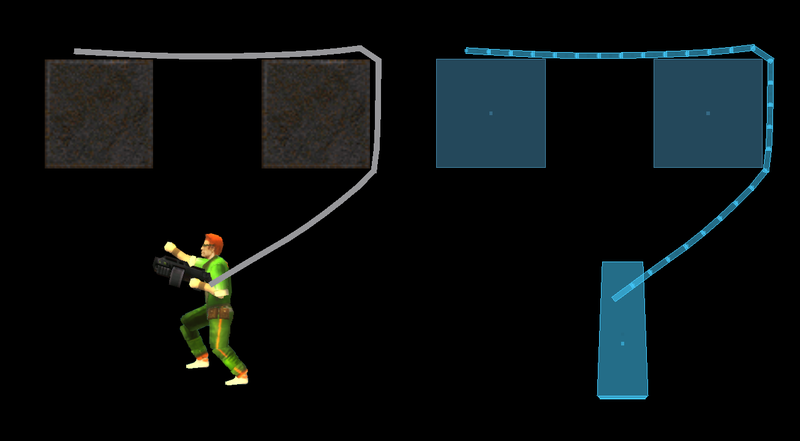 The difference is that the player body will not be able to move closer to where rope connects to the terrain or fall down, since the joint always tries to maintain the same distance. This is actually closer to the ninja rope behavior in Worms than the rope joint option and you can stand on the rope using this method. 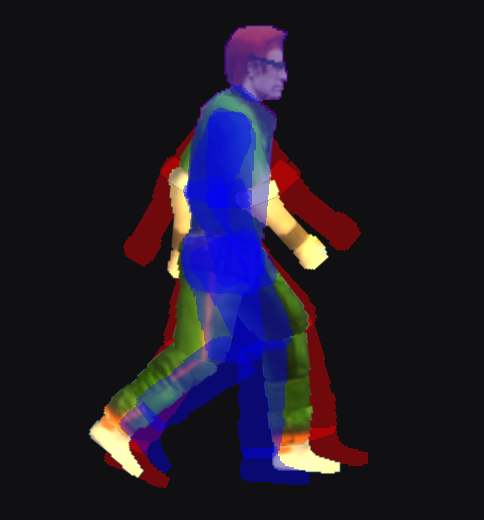 SetLength() can be used to "move" the player along the rope, but similar to the rope joint it tries to push the player to new position even if there is something in the way. a) The rope is a bit hard to control, moves around too much and can stretch. In games like Worms or Bionic Commando the rope isn't behaving very realistically, more important was giving the player intuitive control over it. b) You can't move up/down the rope or stand on it. The positive thing about this method is that the rope can wrap around terrain without any additional coding. 1) For some reason joints are more stable if the bodies connected have higher density value, but the downside is that heavier rope is harder to control. 2) Enable joint motors and set torque to very small value and set the speed to zero, so the chain stops swinging sooner. 3) Connect the terrain and the player with a rope joint to prevent the chain from stretching too much. The max length should be same as the length of the entire chain or just a tiny a bit longer, depending how much do you want to allow it to stretch. 4) Since all the chain bodies would by default have zero linear and angular velocity when created, it would slow down the moving player when initially created. I don't know how to calculate the initial values of each link based on player velocity and stuff, but simply giving all the bodies the same velocity as the player at the moment of creation works good enough. a) With a prismatic joint the body is limited to moving/sliding along an axis and that is exactly what we need. b) Using the joint's motor we can make the attached body move up/down without breaking the physics simulation and if some object is in the way and blocking the movement it will behave normally (unless we set the motor torque to an insanely huge value). c) Using a motor with a high torque we can fix the players position on the rope, so the player can "stand" on the rope, just like in Worms games. 1. Rope/hook (long thin triangle) - a body which is connected to terrain using a revolute joint, so the whole thing can swing. 2. Slider (rectangle) - a body connected to the hook using a prismatic joint, so the player can move up/down the rope using the joint's motor. 3. Rotor (yellow circle) - Usually in Box2D games the player body has a fixed rotation, so it always stays upwards. We can't connect it directly to the slider, because with fixed rotation it wont allow connected bodies to rotate freely. 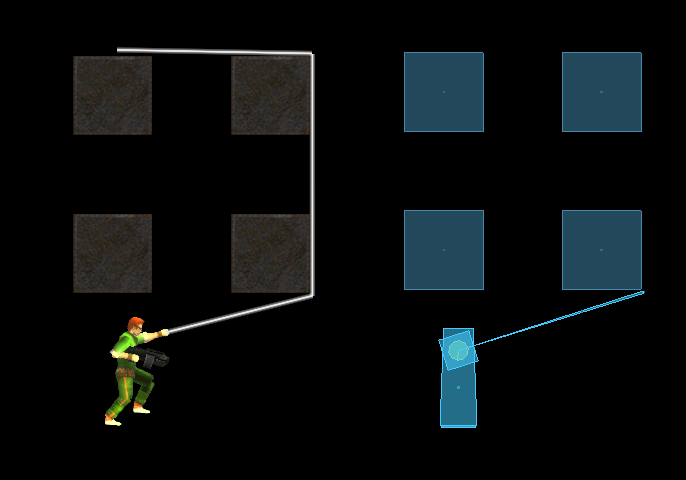 There needs to be a body between the player and slider connected to both with a revolute joint, so the player can maintain the fixed rotation, but the rope can still freely rotate. If you have a player that can rotate freely, this isn't needed and can be attached directly. It is important to note that only one segment of ninja rope is fully active at any given moment. Basically the swinging part will work as described above in the method 4, and the rest of the rope are just static points with a line rendered between them. a) How to detect when a corner is hit and split the rope ? One method is to use the rope/hook part from method 4. It needs to be very long and thin, and needs to be a bullet body. When bullet bodies collide in Box2D you get the exact point of impact in PreSolve() callback function which you can use to determine where the rope needs to be split. - The rope needs to collide with the terrain, but shouldn't bounce of the terrain, we just need the collision point. So in the PreSolve() callback the contact needs to be disabled with contact->SetEnabled(false). - The rope should not be connected directly on the collision point, because we don't want the tip of the rope/hook to constantly collide around that point while rotating and cause problems. The connection point needs to be a bit outside of the terrain body (see image above). When existing rope collides all the rope objects are deleted and the rope is recreated in that collision point. Like mentioned previously; only the last part of the rope is active. The previous connection points are still needed to render the entire rope and to know when to reconnect the parts. The downside of using this method is that when the player is moved all the way up the rope, you have all this extra mass bellow him (the player in not the center of mass) that can cause unwanted movement. The solution is to make the rope/hook body very small, so the center of mass is always the player, and use some other method to find out where the rope hits the terrain. b) How to reconnect it all again ? Two last rope points is the line you need to cross, and the point you check is the current player position. If you crossed the line you remove the last rope point and recreate the rope in the last of the remaining collision points. While doing all this splitting and reconnecting you need to keep in mind the total length of the rope, and change the rope/hook body length accordingly. You can try it out for yourself using the link above. I also uploaded the source code for the rope handling. Not sure how useful it will be, since I just copied it from my game/engine, so don't expect to just copy/paste it into your code and think it will work. Think of it more as a sign of goodwill. Don't forget to read the included README. This blog seems to be under "attack" by bots or something. For the last month I'm getting ten times more daily views than the average was. It started on September 30th. Every few hours the statistics shows a spike of 30 new views, and every day the same thing. The views are coming from USA, operating system is Macintosh and the browser is Chrome, but it shows no referring site or anything to pinpoint the source. It has made the statistics data completely useless. Here is a video showing the updated particle system and editor, and some stuff that can be done with them. It was all inspired by Unreal Engine particle system. Particle effects can contain several emitters and emitter and particle values are not just variables they are "modules" with "distributions" and stuff to control the values over time, etc. There are around 30 of these modules; emitter and particle lifetime, particle width, height, speed, direction, color, angle, number of particles on init/on update... Each effect, and even particles, can have dynamic light attached to them. Also, particles can be attached to a Box2D body, but then some of the functions wont work (particle position will be updated by Box2D and not by emitter functions). I also implemented ribbon and beam/line emitters. - Fireworks - shows "nested" effects. Each particle can carry its own effect(rocket trail) and also can create a new one at the end of its life(explosion). - Text - various line effects. The lightning effect uses a tilemap. - Circles - nothing special, just a bunch of circular effects. - Sparks - shows Box2D enabled particles. Particles change rotation and size based on velocity. - Ribbons - ribbon effect can be attached to other particles or objects. - Flamethrower - shows effect and individual particle lights, and also collision response (creating ground fire on particle-ground contact). - Colored lights - shows particles with colored dynamic light. - Paint explosions - shows creation of decals on contact on static and moving objects. - Particle effect editor - shows how one effect can be made of several particle emitters. - Leafs - shows direction change using a sin wave. Updating, saving, parsing, then the editor code itself.... it's well over 5000 lines of code. It all became over complicated and confusing and I don't know does it even make any sense anymore, I just lack the knowledge to design such a complicated system. 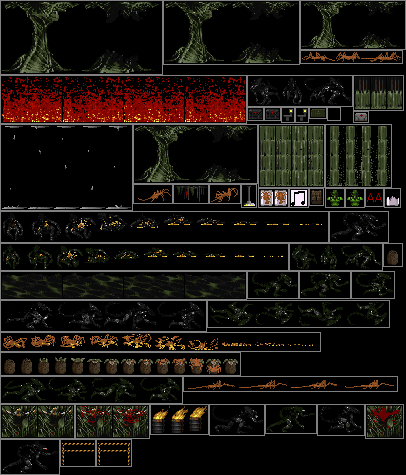 Quake 2D didn't even have a particle system, it was all hand made and hardcoded, and it still worked. I have been working on the particle effects until March and then completely stopped. Then fooled around with Abuse SDL and haven't coded since. I wanted to post this way back in March, but just didn't want to bother anymore. When I released my Quake 2D demo back in 2012 many people compared it to Abuse, a game by Crack dot Com released in 1996. While I was waiting for my new PC to get fixed(it took months!) I was stuck with a PC bought in 2005. I already played everything I could on it and my gaming options were limited. I found out Abuse was available for free, so I wanted to check it out. It ran in DOSBox at 320x200 resolution and felt like playing a FPS game with very low FOV. Aiming with the mouse was very difficult, because even in fullscreen the mouse was still behaving like it was 320x200 resolution and was too sensitive. Reading the included readme file I saw there was a high resolution option, but it seemed to be only available in the shareware version or in editor mode, and the game would automatically turn off the in-game lights, because it would be too demanding for the PCs in 1996 on high resolutions. Not to mention a bug would cause the entire screen to go black the second time a level was loaded. While looking for a fix I found out the original source code was released and there were several source ports released during the years, mostly for Linux. Finally Xenoveritas SDL2 port from 2014 showed up in the search results and was exactly what I needed; a working Windows port, plus it had instructions how to build it. As you can see the game gets pretty intense. It's a classic design where you need to find switches to open new areas, and you need to cleverly use security turrets and destructible walls to fight the enemies. It takes 2-3 hours to beat the game. Thank you for playing Abuse!